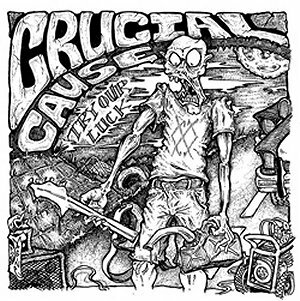 CRUCIAL CAUSE "Try our luck"
Brand new on Flat Black Records, CRUCIAL CAUSE brings the scene 6 songs of HC in the vein of YOUTH OF TODAY, SIDE BY SIDE, SICK OF IT ALL, LIFE'S BLOOD and NO FOR AN ANSWER. You get the idea, Positive but still Negative sounding HC, with loads of fun- but still containing all the rage you need in an HC record! !